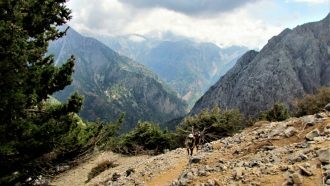 Take this epic 15-day trek and discover the amazing nature of Crete walking from the north to south coast, then take in all the stunning gorges of the southwest. 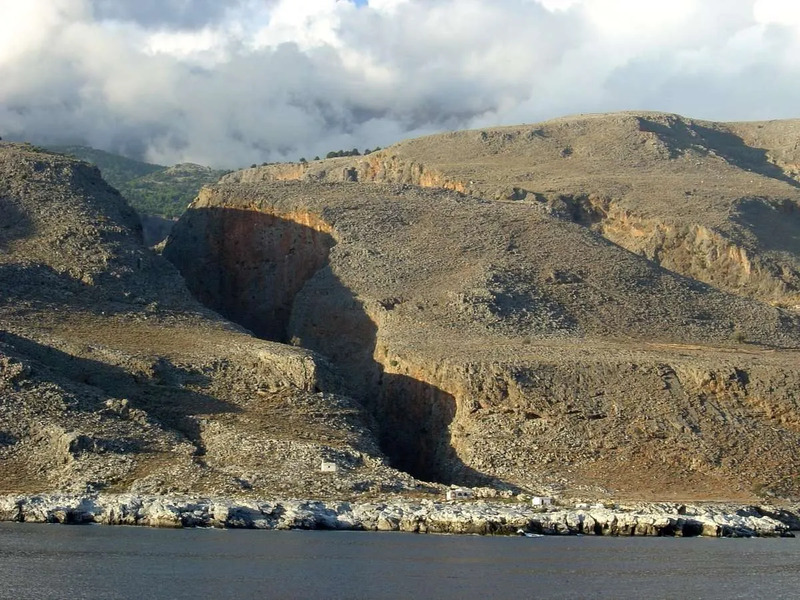 This tour will take you via the Lefka Ora (White Mountains) to the secluded beaches of the south coast, where you will walk through one of its most beautiful gorges, Sfakia Gorge. 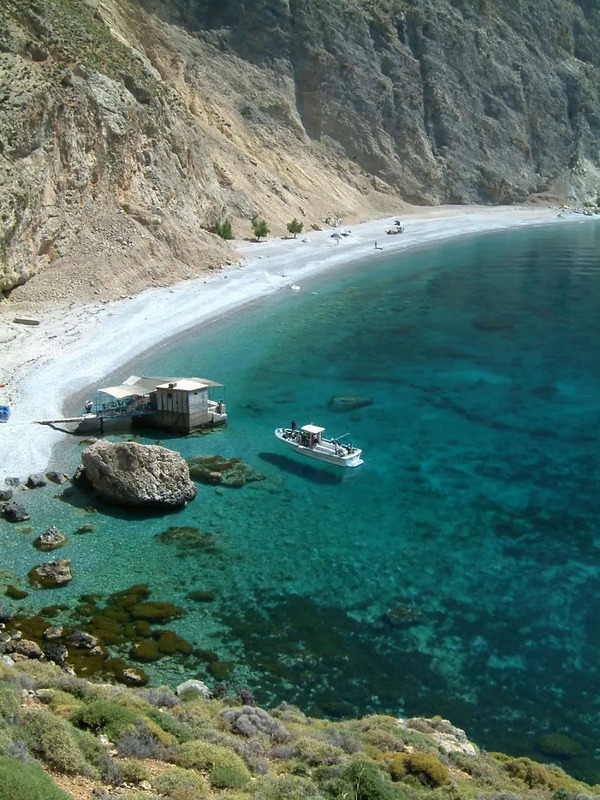 Reach the most romantic village on Crete, the idyllic Loutro, accessible only by boat or on foot. 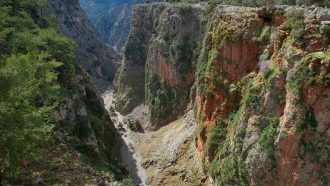 Explore the imposing Anydri and Irini Gorges, full of flowering oleander bushes, and the impressive Aradhena Gorge, a challenging bur rewarding walk you’ll never forget. 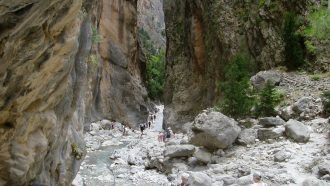 The final highlight is walking down the famous Samaria Gorge to the seashore. A pleasant walk through the agricultural landscapes of Apokoronas. 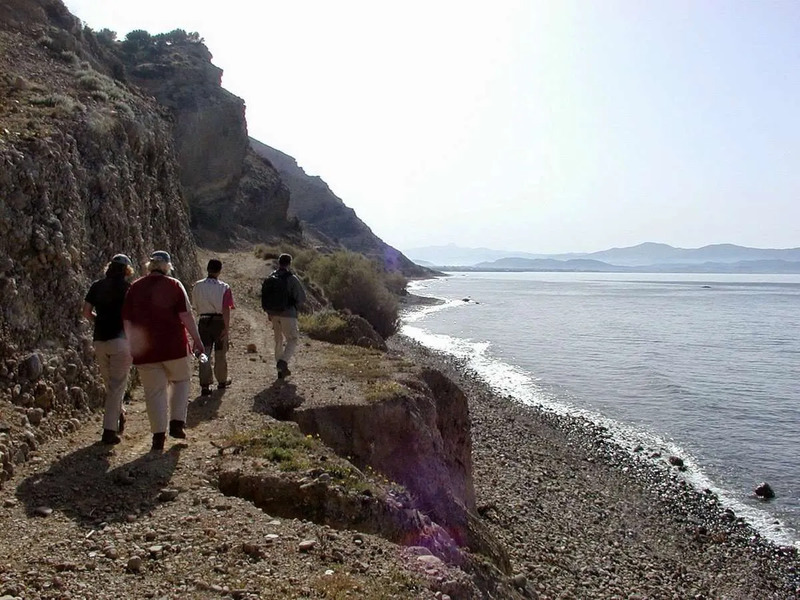 After a short transfer, you will walk along several villages to the seaside town of Georgioupolis and then back to Vamos. 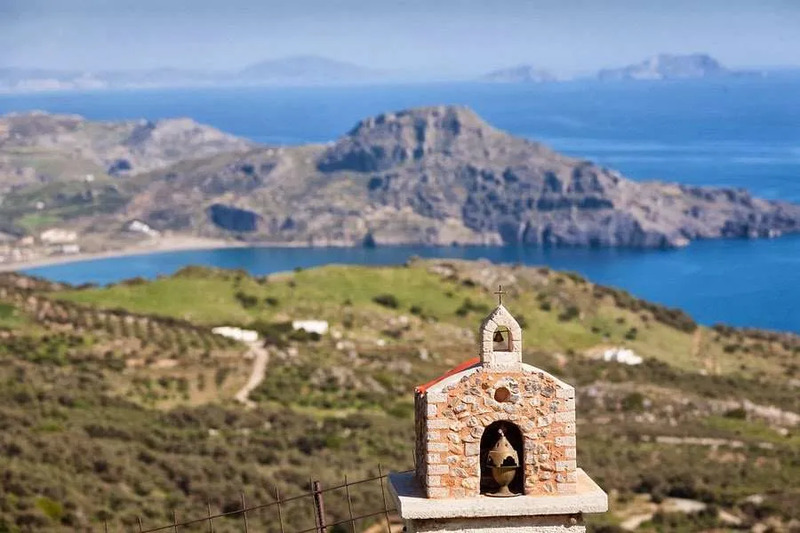 Great views, a monastery, scattered churches and the oldest olive press of Western Crete will please you in this first walking day of the tour. You will make a round walk from the village of Nippos, embedded in the lush green area of Apokoronas. Cypresses and olive groves cover this hilly area. 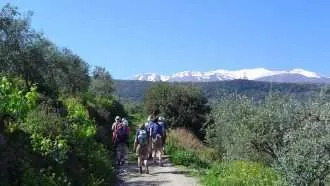 On the background will be the Lefka Ori, covered with snow in winter and spring, making you feel like walking in a painting. 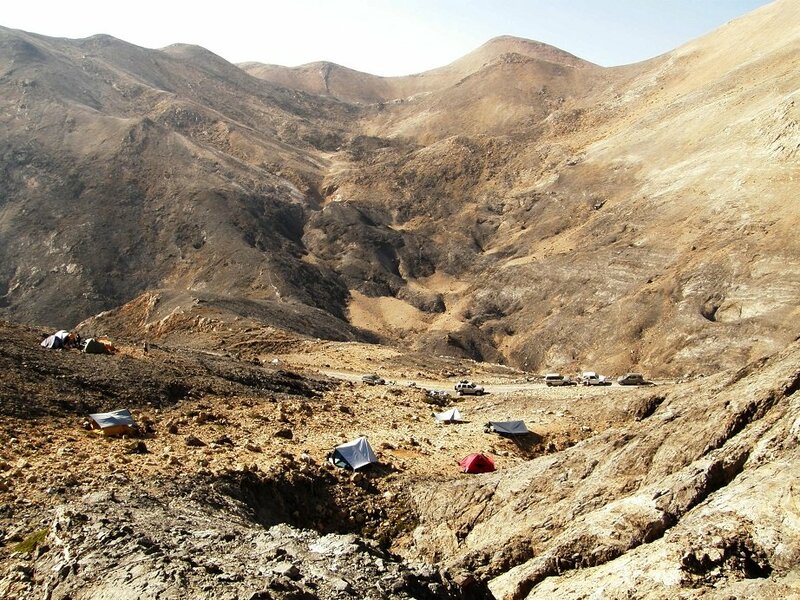 After the walk, you will travel comfortably by taxi to your next accommodation on the Askifou plain, in the Lefka Ori (White Mountains). 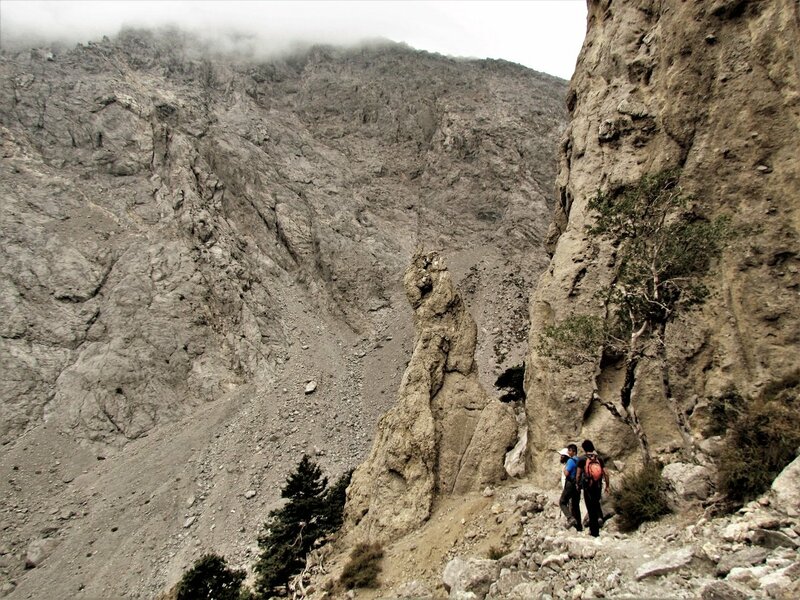 For today a challenging walk in the mountains is planned. 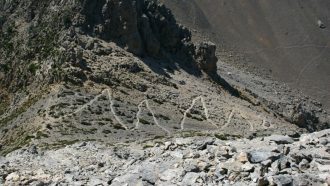 You will walk up to 1,300m and admire 2,000m peaks, covered with snow in spring. There are no villages in this area; you may occasionally bump into a shepherd with his goats or sheep. The way back down to Askifou is via a beautiful old path through dense forest. 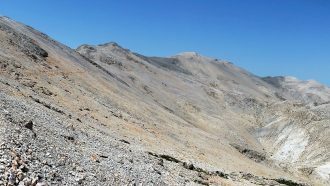 Now and then you will have great views to the Askifou plain. 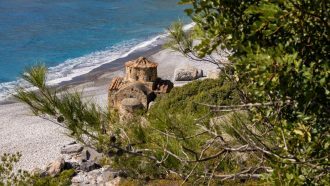 In case you prefer a less strenuous walk, you can take the coastal walking route to Loutro, with the option to go for a swim at the Fresh Water Beach. 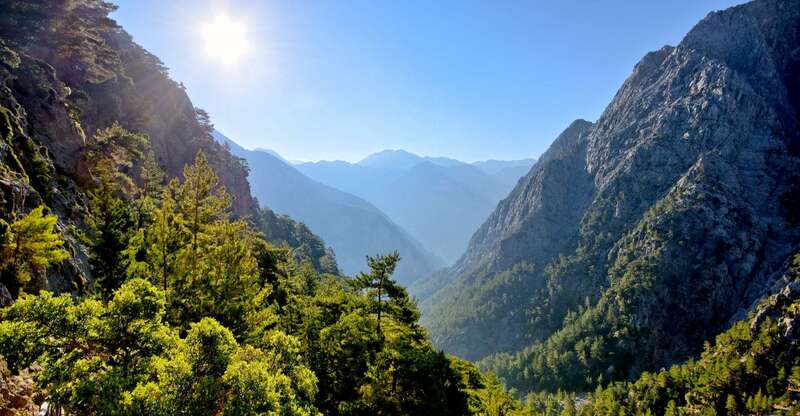 A short transfer from the hotel brings you to the village of Imbros where you can get some supplies in the mini market, before entering the second famous gorge of Crete: the Imbros gorge. 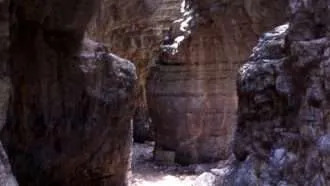 You will be walking for about two hours along a rocky riverbed with loose stones and rocks alternated with easier sections. 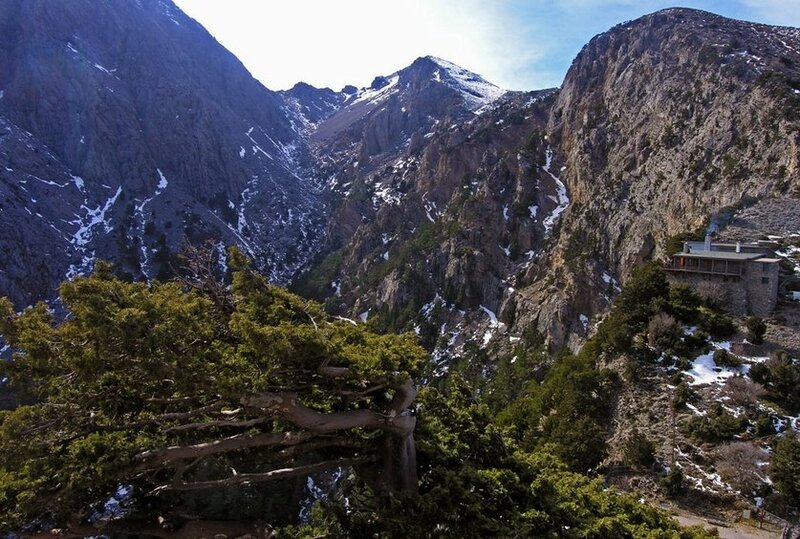 The landscapes here are other-worldly; at its narrowest point, the Imbros gorge is only 1.60m wide! When you sit and have your picnic lunch and listen to the silence it will be hard to imagine the immense forces that created this impressive landscape. 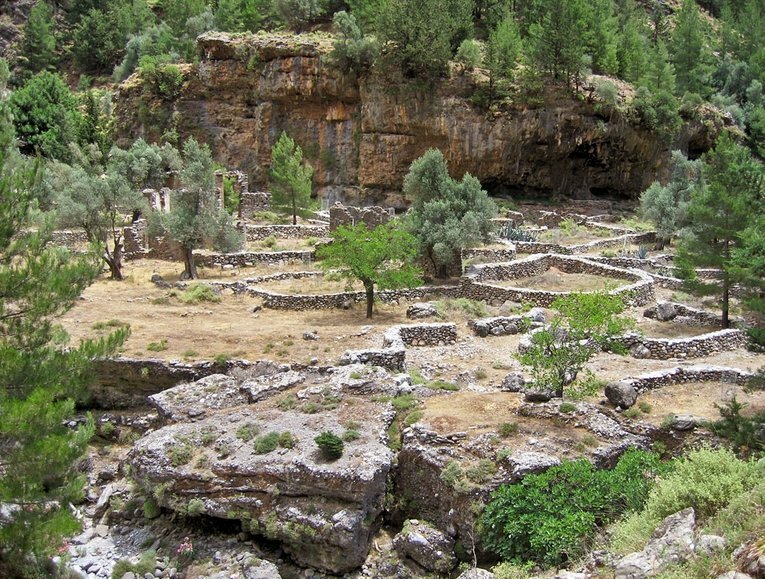 At the end of the gorge, you come to Komitades where you may relax and have lunch in one of the taverns. 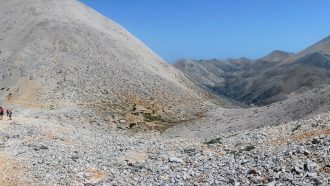 Then you continue your walk through agricultural fields and across the Sfakia gorge until you reach Chora Sfakion, located on the Libyan Sea coast. You may end you day with a refreshing swim. 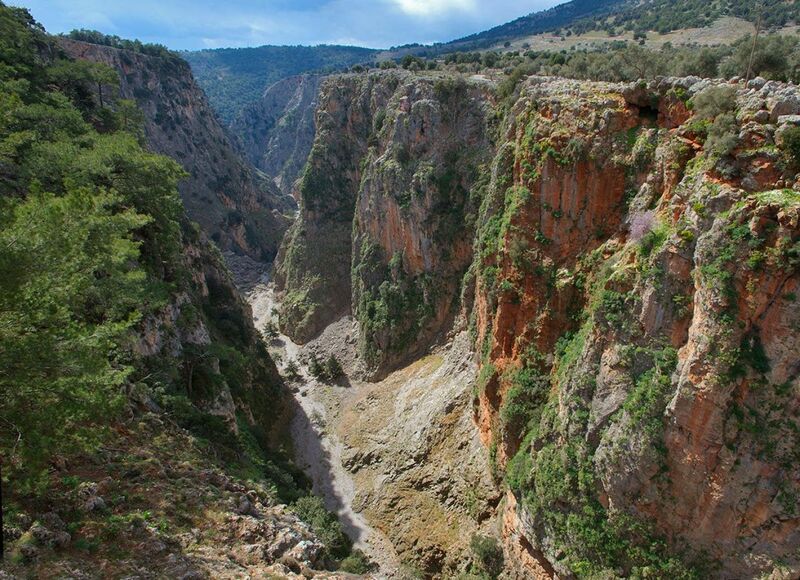 From Chora Sfakion you climb through the Ilinga Gorge to the authentic village of Anopolis. 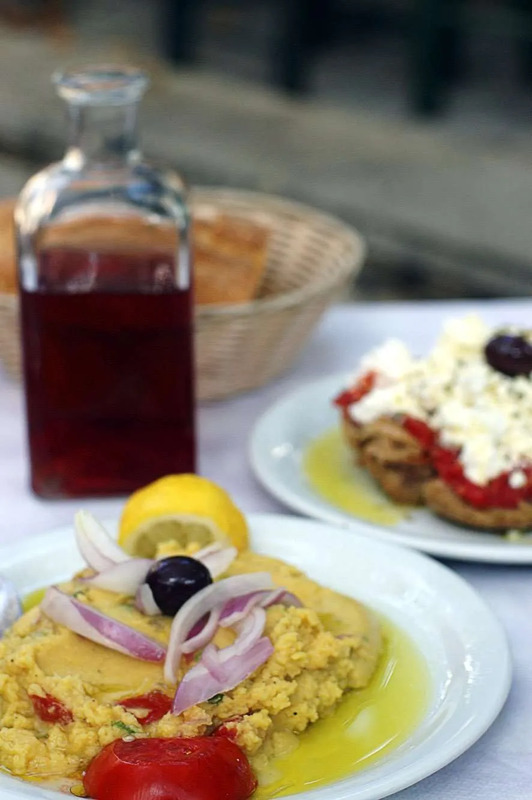 Here you meet locals in the kafeneion and you may try one of those excellent Sfakiana pittas yourself: a sort of pancake with cream cheese and honey. This will give you energy for the rest of the walk. 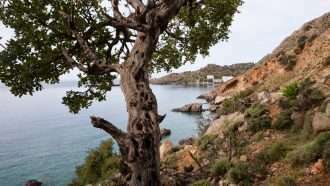 You will descend along a terrific path to the village of Loutro, hidden in a tiny, perfectly round, bay. 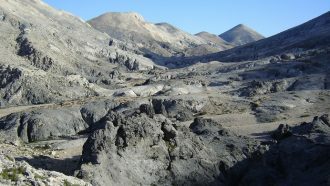 Loutro is only accessible by ferry or walking and there are no cars. 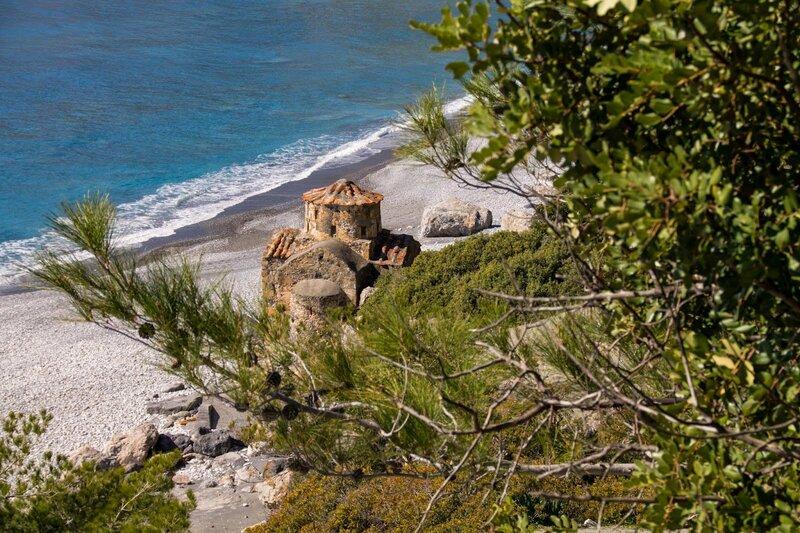 Throughout the walk you will have splendid views of the sea and Loutro. 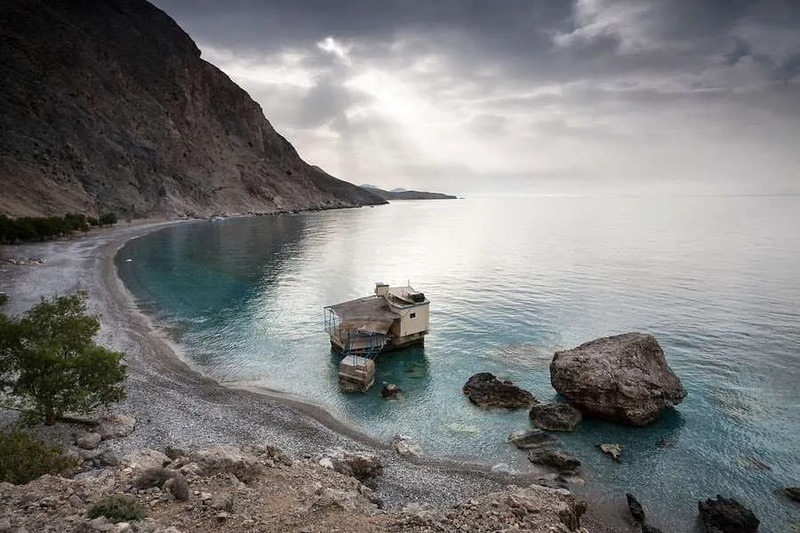 You spend the last two nights of this tour in Loutro. 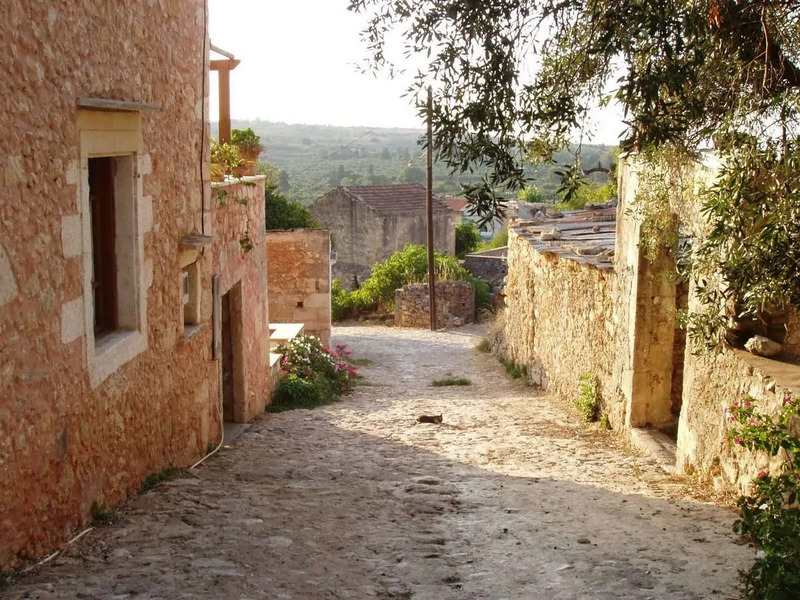 Via a steep zig-zag path you climb up to the village Anopolis. 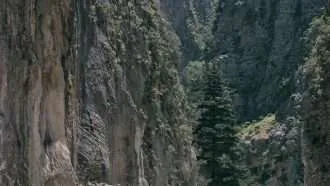 From here you walk further onto Ancient Aradhena, located on the edge of the impressive Aradhena Gorge. 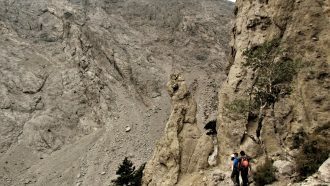 A spectacular path takes you down into the Aradhena Gorge which you follow until you reach the coast. 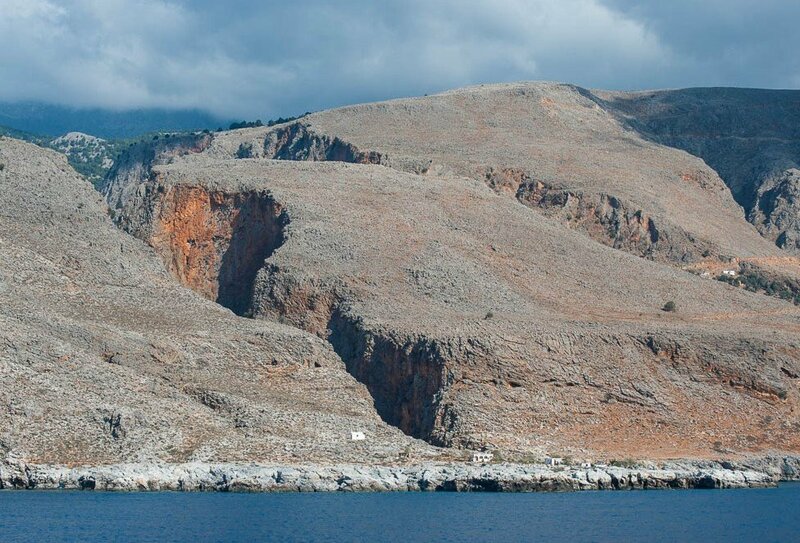 During the last part of today’s walk you will follow a path along the coast back to Loutro. Take the ferry to Paleochora (not included, tickets available only on site). 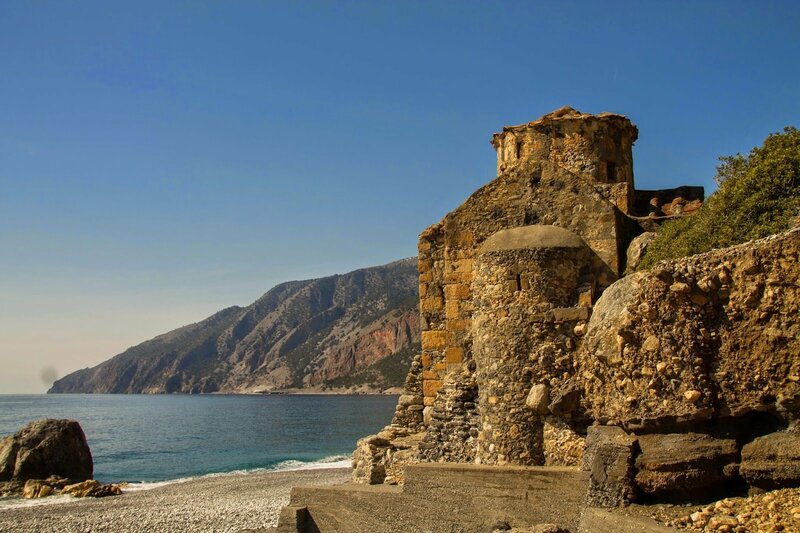 Depending on your arrival time, you can go for a stroll to the cozy seaside town of Paleochora and explore the nearby Venetian fortress and several sandy and rocky beaches. 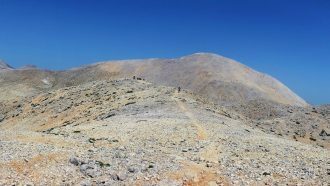 Note that this walk is not possible from June to September, when there is an alternative route going from Elafonissos to Paleochora. 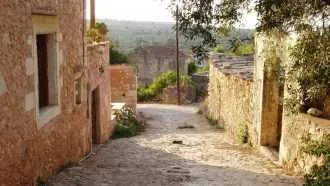 After breakfast, a transfer takes you to the village of Azogires where your walk starts along the ‘Monastery of the 99 Monks’-trail. 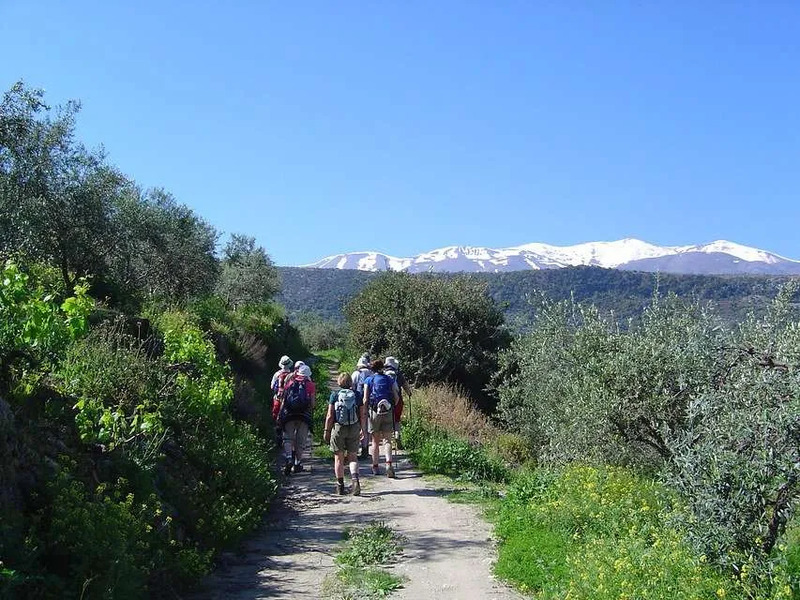 The walk for the day will take you through olive groves, the quiet hilltop village of Anidri with its Byzantine church and the popular school house tavern, the small gorge of Anidri and the tranquil beach of Gialiskari. The final part goes through a coastal stretch taking you back to Paleochora, as you may go for a swim before going back to your hotel. 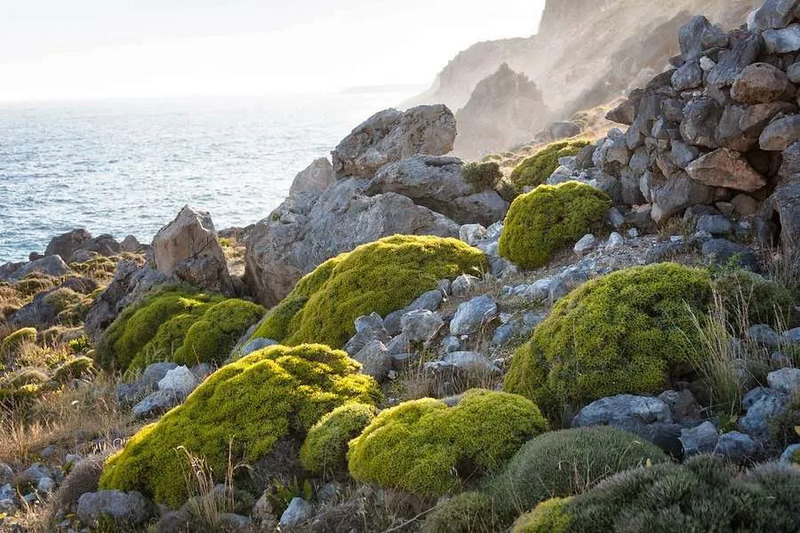 From June to September you should go on an alternative walk, including a relaxing ferry journey from Paleochora to the beautiful Elafonissi Lagoon, from where you walk back towards Paleochora along the coast (the ferry runs daily except Sundays from June to September). En route, you will pass beautiful, remote sandy beaches – ideal spots to enjoy a refreshing dip. The walk ends at Kryos Beach, where a taxi will pick you up for the transfer back to your hotel. In case the ferry is not running, you can have a taxi transfer to Azogires and walk down to Paleochora. 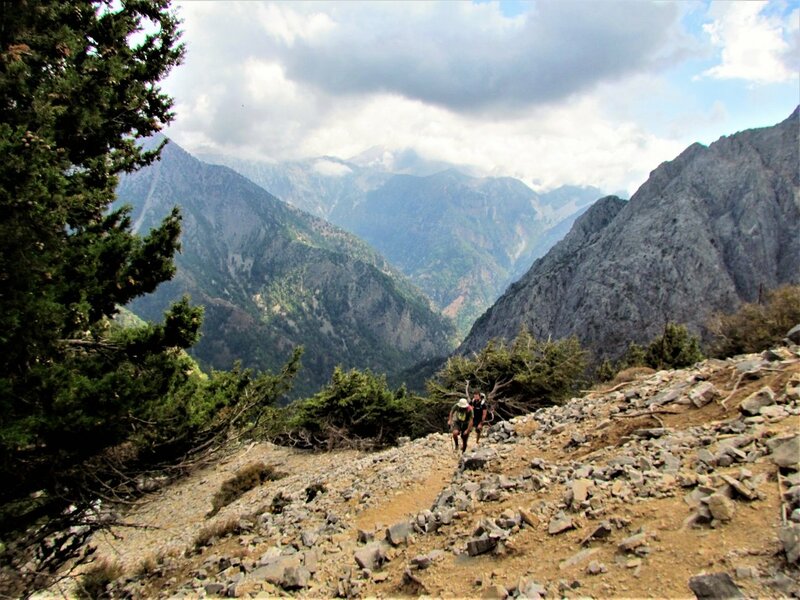 Starting in Paleochora, you follow a dirt track into a quiet natural wilderness, continuing along a stunning coastal path overlooking the sea. 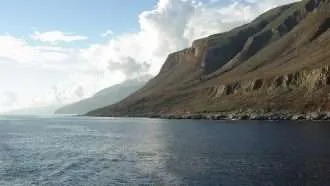 Along the way you will pass the ancient Lissos, an important harbour for the Dorian city of Elyros, which boasted a population of 30,000 at its peak. 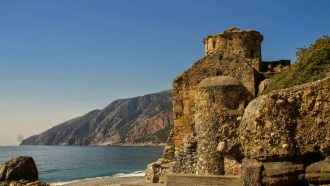 You can enjoy a picnic lunch on this historic spot and swim in the pristine waters before heading further east to Sougia through a beautiful narrow gorge. 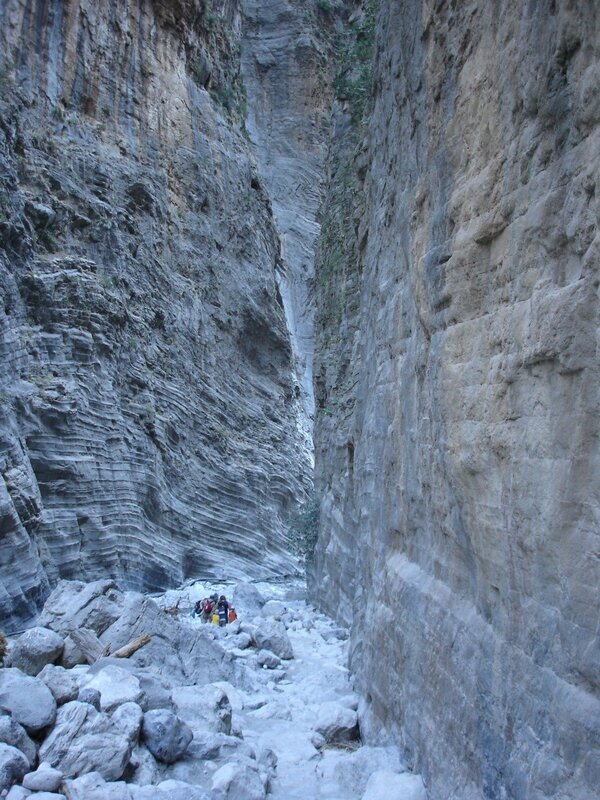 Today you will explore two impressive gorges, from sea level up to 1,000m. 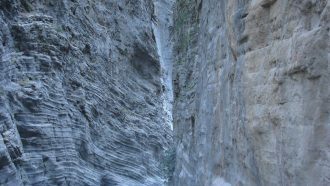 First, you walk through the impressive Irini Gorge on a well-made path. The ascent is long but not too steep. 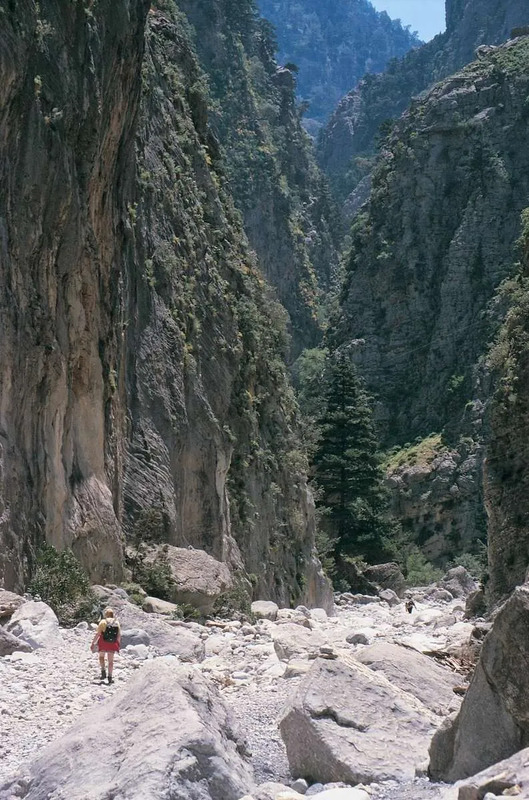 Leaving the Irini Gorge behind, you walk into the steeper Figou Gorge. You will enjoy stunning views at some points. 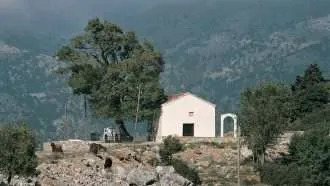 The walk ends at a chapel, ‘Agios Theodoros’, where the hotel’s minibus will pick you up. 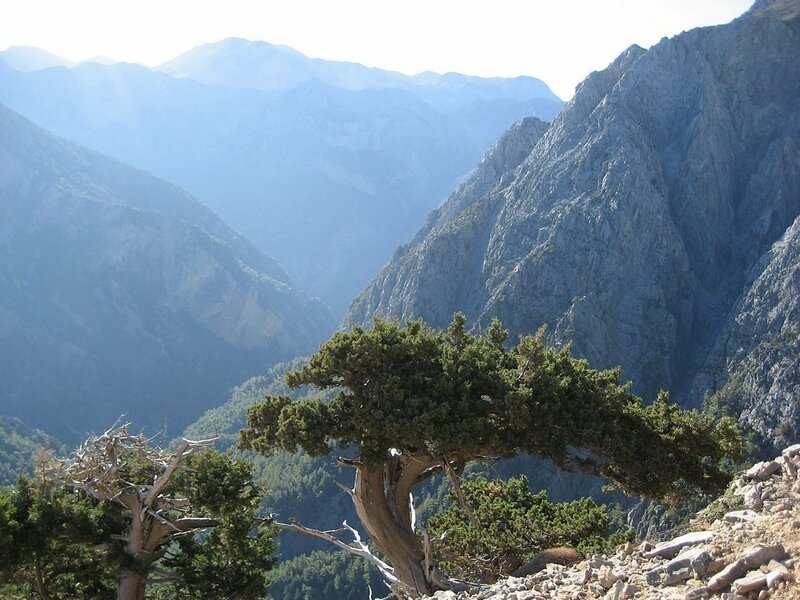 Today’s day is located on the Omalos plain surrounded by the spectacular summits of the White Mountains. 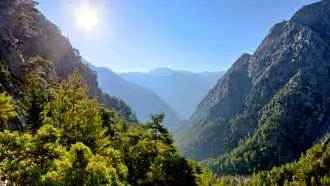 Note that the Samaria gorge is open from 1st of May until the autumn rains start (usually end of October). 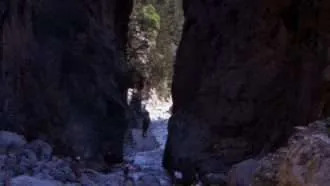 It is also possible for the gorge to be closed at any time by authorities in case of flash flood alerts, in such case an alternative route will be provided. 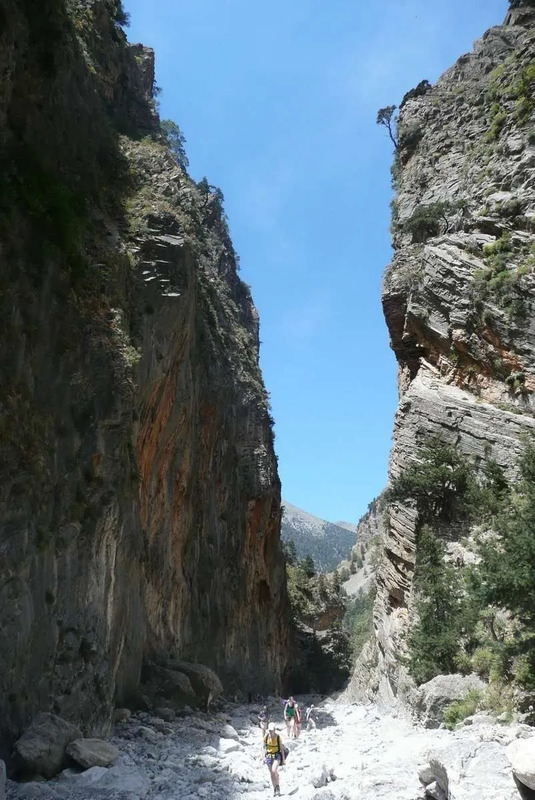 Today you walk through one of Europe’s longest and most spectacular canyons: the Samaria Gorge. 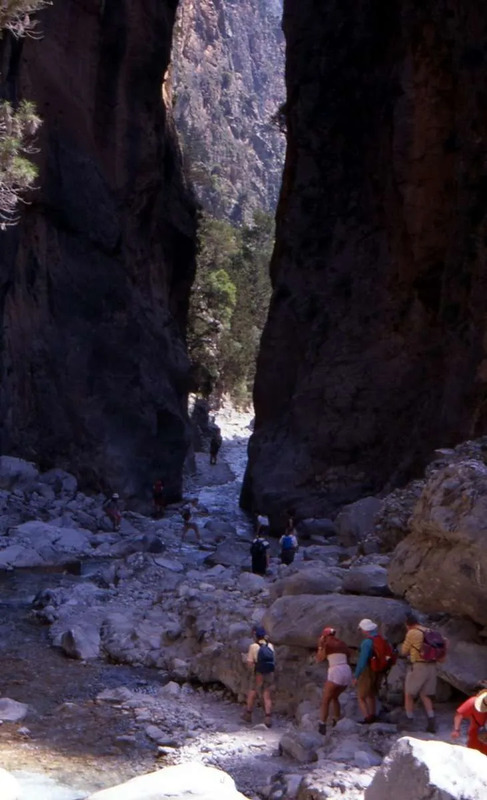 We recommend you to start your walk either very early or rather late, in order to avoid the crowds of people walking through the gorge as a day trip. 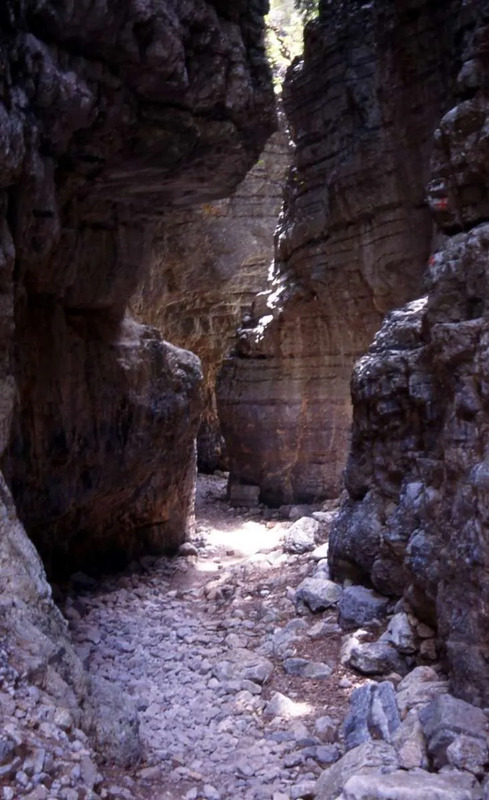 During the quieter hours, you’ll enjoy the true beauty of this spectacular gorge. 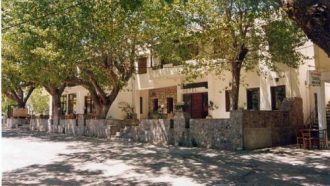 You spend the night in the seaside village of Agia Roumeli at the end of the gorge leaving you plenty of time for the walk. 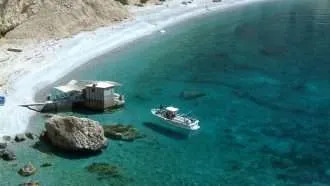 As you finish with the walking you can go for a relaxing swim in the crystal clear Lybian sea before you set off for dinner at one of the local taverns in Agia Roumeli. 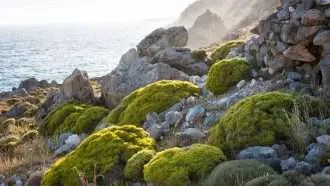 A splendid coastal walk with lots of variety. 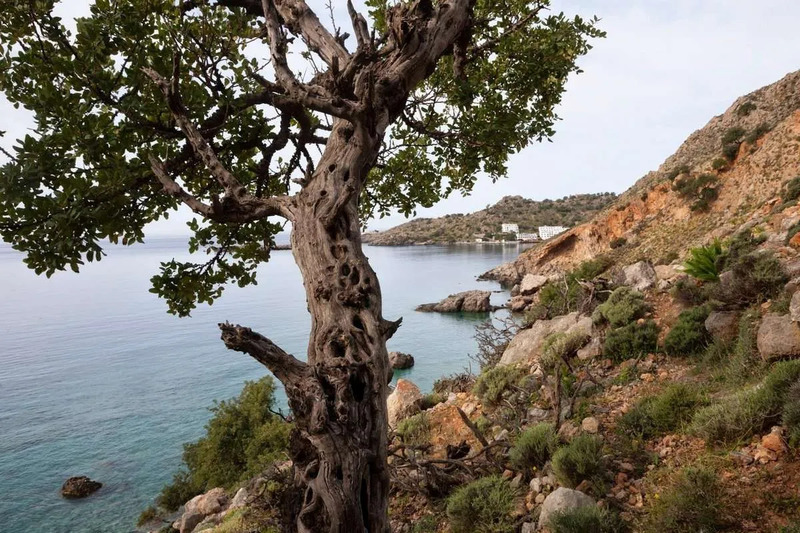 The walk today starts along the beach to the Byzantine church of Agios Pavlos, from where you start ascending through a fir forest reaching the beach at Marmara. 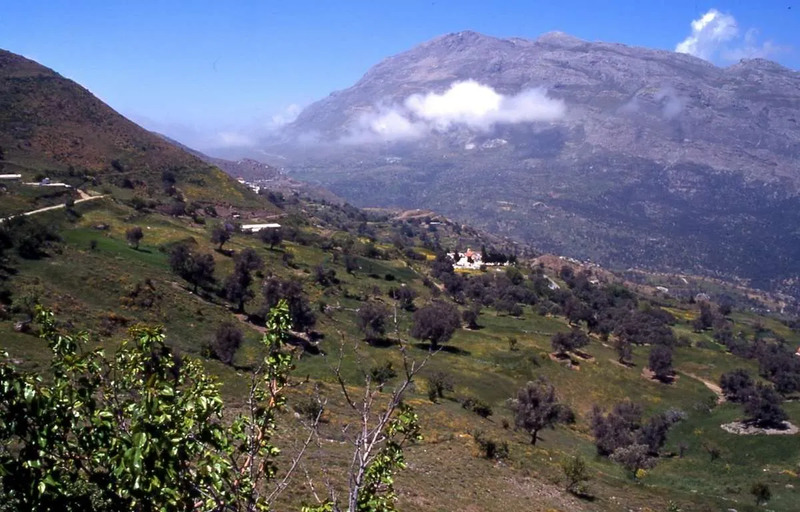 On the way, you will enjoy great views of the massive mountains at your left and the sea to your right. As you reach the beach, you can enjoy the local tavern or go for a swim. 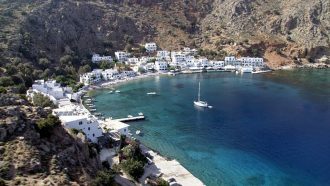 From Marmara, you’ll need another hour along the coast to reach the car-free village of Loutro. 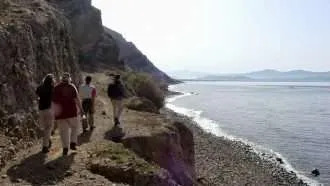 Make a relaxing walk today via Livaniana (a tiny village) and then descend via the Aradhena Gorge to the sea. 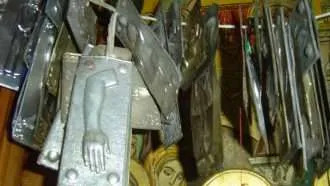 It may be necessary, depending on your departure flight tomorrow, to travel today back to Chora Sfakion by ferry and on to Chania or to Heraklion. 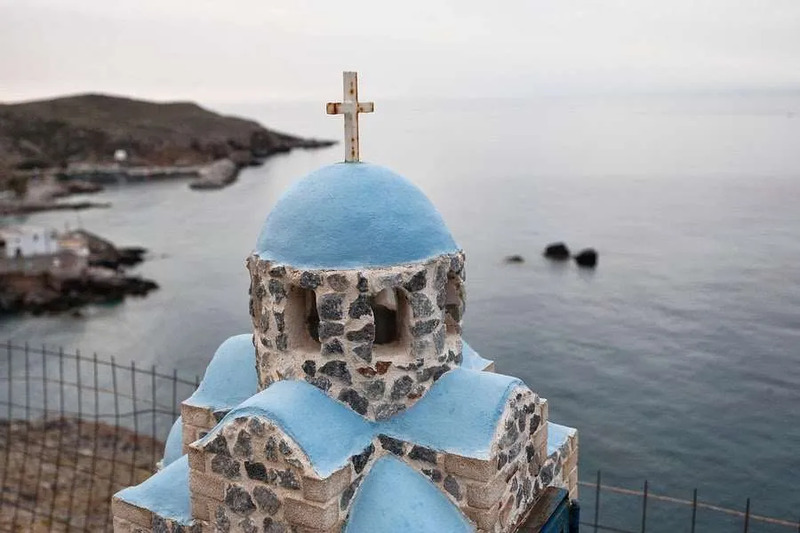 Today you travel back to Chora Sfakion by ferry in the morning from where you catch public transport or pre-booked transfer to Chania or Heraklion Airport. 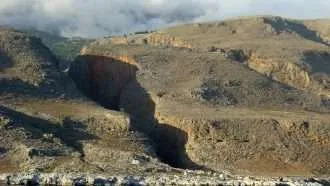 In this part of Crete the choice of accommodation is limited. We have carefully hand-picked all places and regularly monitor their quality. We have tried to choose accommodations that offer friendly service, clean and comfortable rooms and local flavour. 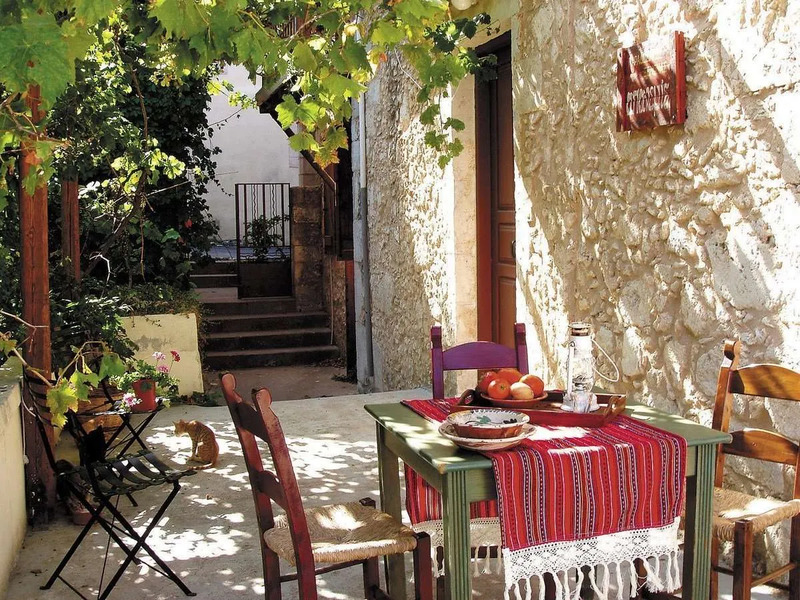 All rooms have private facilities and almost always a balcony or a terrace. Vamos Village consists of wonderful restored houses in the old village centre of Vamos. 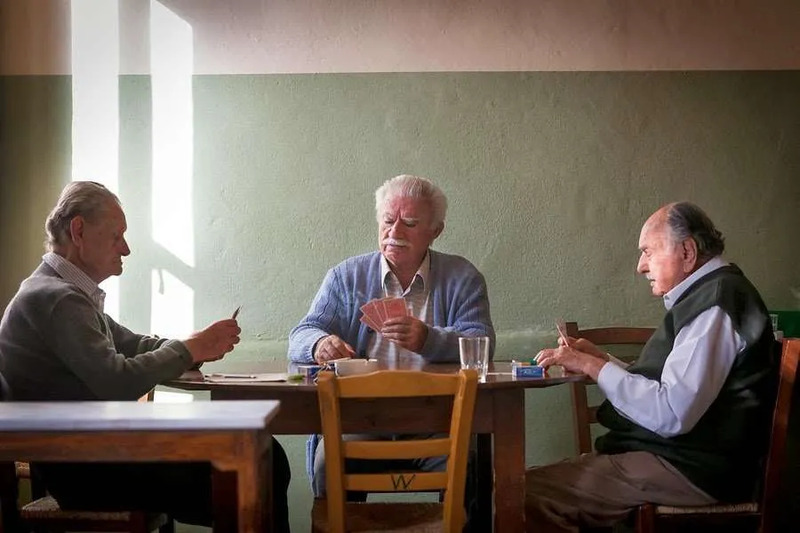 The houses are usually separated into smaller independent units. In the houses you will find characteristic features in the building, sometimes you find traditional sofa beds. Furniture is all in traditional style, but meets today’s demands for comfort. Hand made traditional embroideries make that you can really feel like a local Cretan citizen of a rural village. 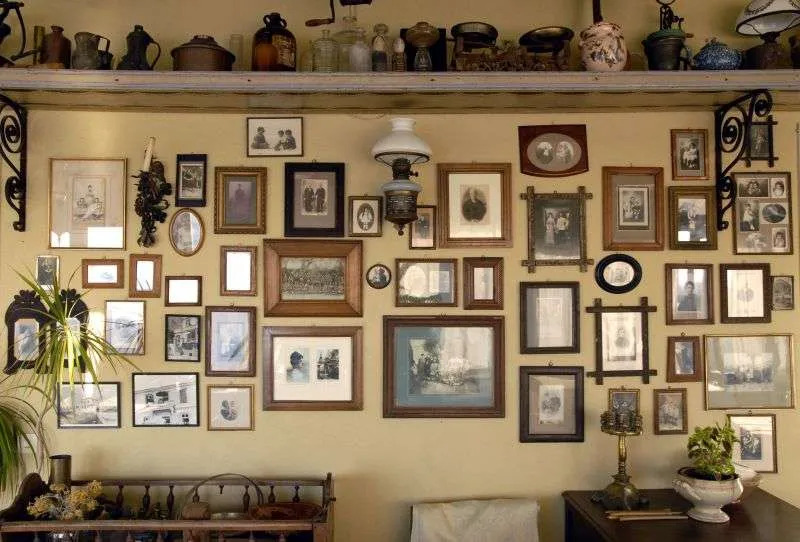 Every house is unique; there is always a kitchen or kitchenette and a comfortable bath room, a TV and a terrace or garden. Some houses also have fire places. 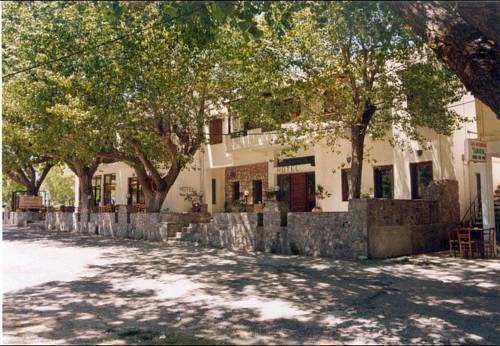 Lefkoritis is a recently-built apartment complex in traditional style. The owner made use of stone from the surroundings. 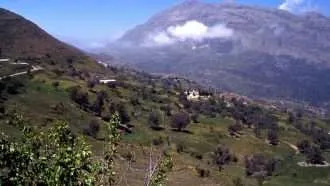 The hotel is located at the side of the big Askifou plain and the views from the balconies are breathtaking. There are 2- and 3-room apartments with respectively 1 and 2 bedrooms. 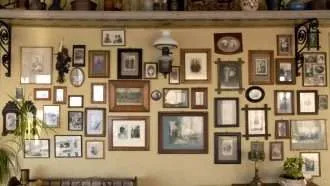 The furniture is warm, traditional style with comfortable beds and a nice bathroom. The swimming pool with panoramic views, makes the Lefkoritis Resort the ideal place to stay after a walking day. 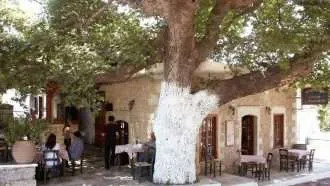 In Chora Sfakion you stay in Hotel Xenia, located on the best location in town. 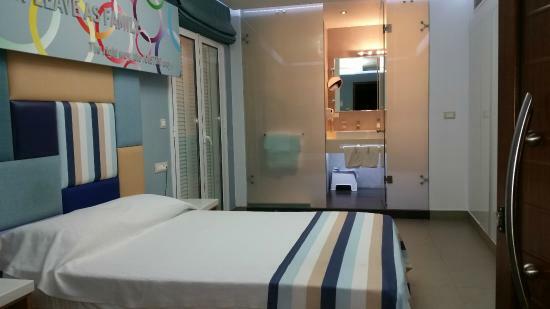 The tidy rooms are equipped with shower/toilet, a fridge, TV and air-conditioning. 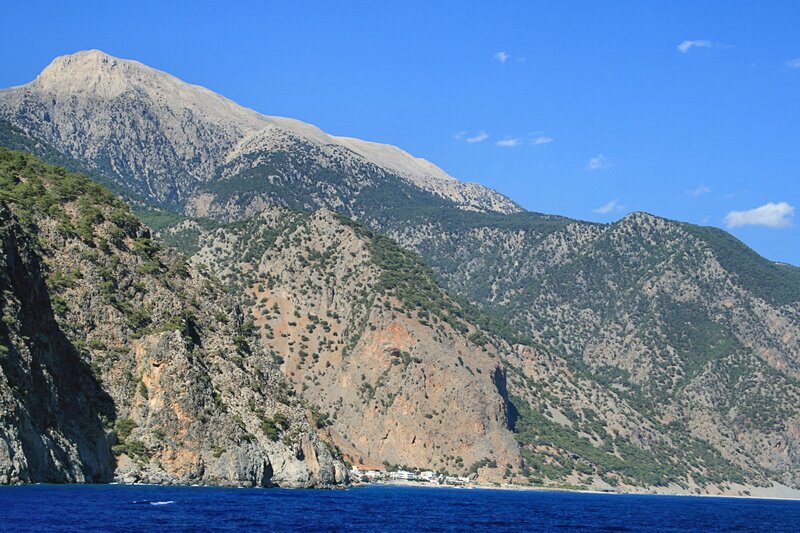 From the balcony you can enjoy the great view over the bay of Chora Sfakion and the surrounding mountains. The hotel is on the quay, close to the beach, the port and the seaside taverns. 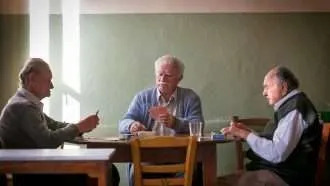 The hotel also offers a restaurant for evening dinners. 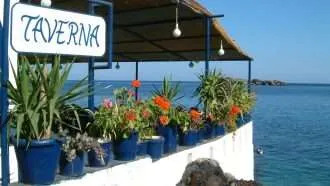 The restaurant uses local ingredients, such as fish, meat and vegetables, to prepare local specialities. Hotel Aris offers clean rooms with balcony or terrace and is near the sea. The friendly owner Aris guarantees a pleasant stay. 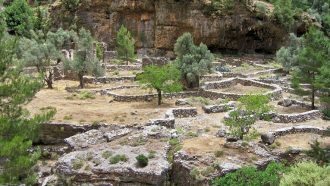 The small seaside resort Sougia is at the end of the Irini gorge. There is a huge beach and you will enjoy a laid-back atmosphere. 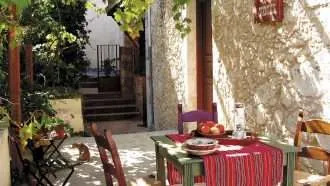 The apartments & studios of Hotel Syia are located 200m from the sea and offer a comfortable stay. 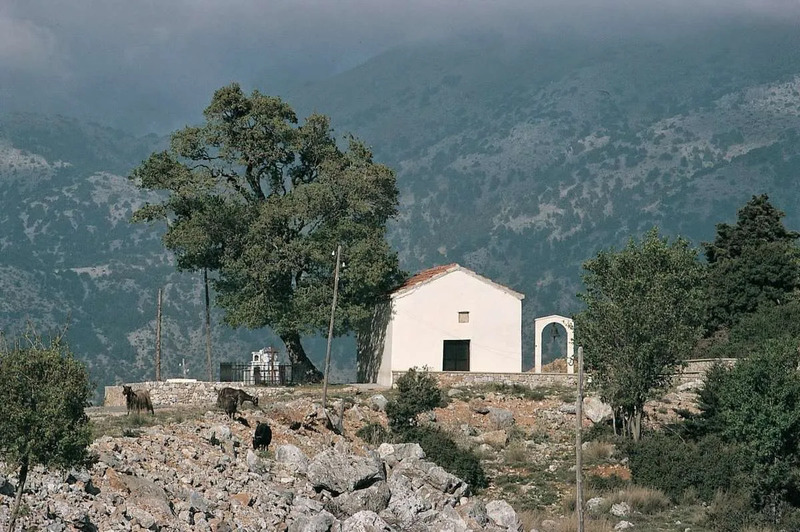 On the Omalos plain you spend the night in Hotel Neos Omalos at 1,100m. Rooms are basic, but comfortable. 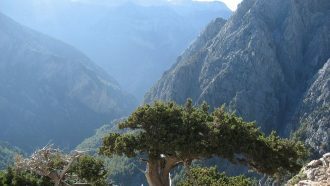 Agia Roumeli is the small village at the end of the famous Samaria gorge. 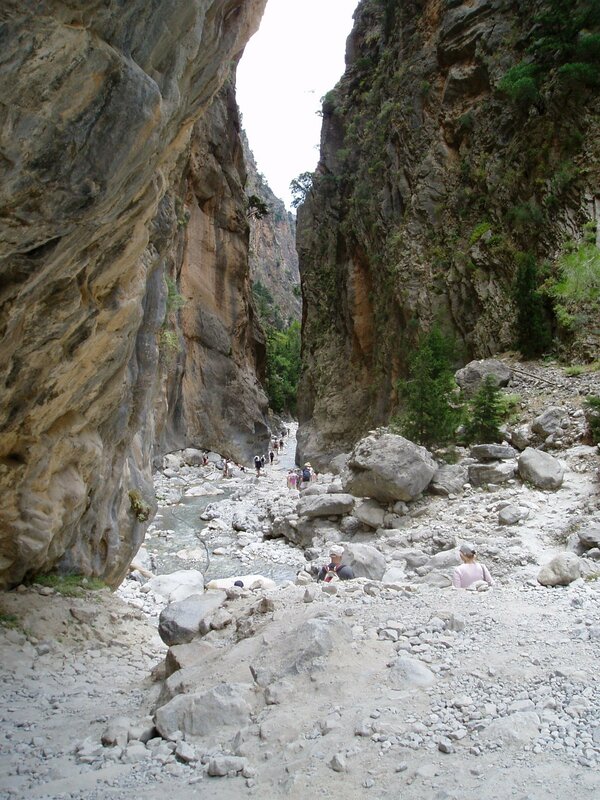 No organized trips through the gorge include an overnight in Agia Roumeli, so it is nice and quiet at night. The Pachnes Pension is new and pleasantly furbished. 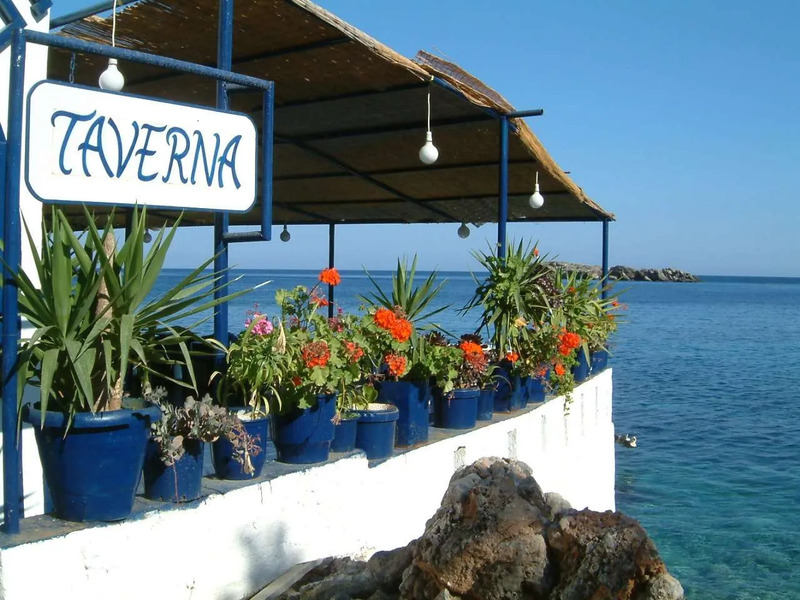 It is 200m from the beach and the port of Agia Roumeli. 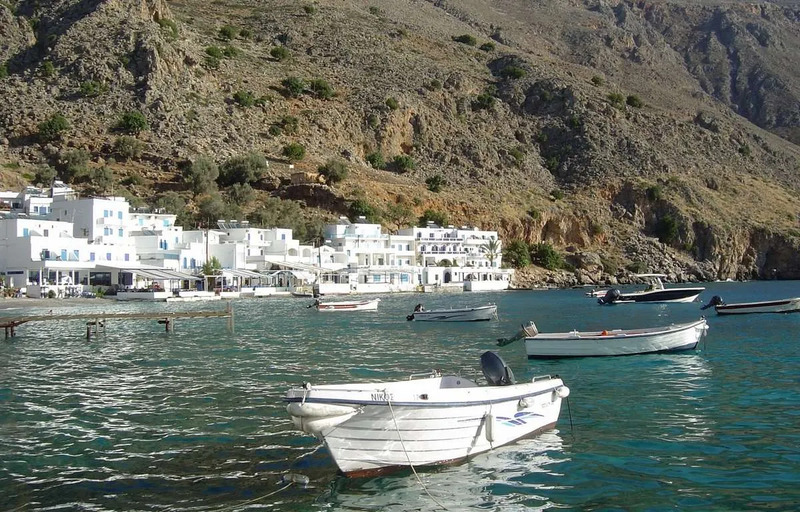 In Loutro you stay in the Protopapas Pension with a tavern and well-maintained rooms with a balcony overlooking the deep blue sea, the white-washed houses or the mountains. *In most cases you will stay in the default accommodations as listed above. Occasionally an alternative accommodation will be confirmed to you. 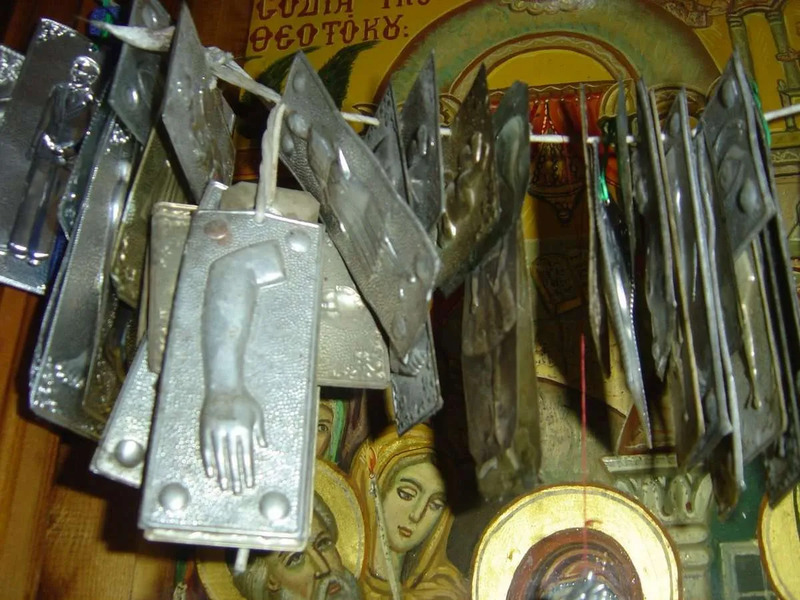 This may happen especially in the busy village of Chora Sfakion. When an alternative accommodation is necessary, we always try to maintain the same standards and quality. 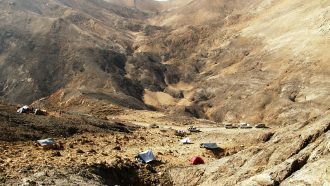 When staying in an alternative accommodation, the walks are never affected. We will provide exact accommodation details to you upon booking confirmation. Breakfast is included on all days. Products for lunch are available in the local shops. At Omalos you may ask for a packed lunch at the accommodation. In the evening you have a wide choice of seaside taverns at all locations. 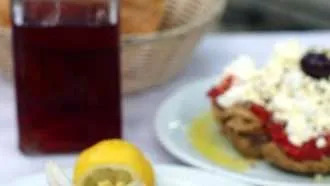 In Omalos there is a limited choice, but the restaurant of the hotel itself offers good, local dishes. 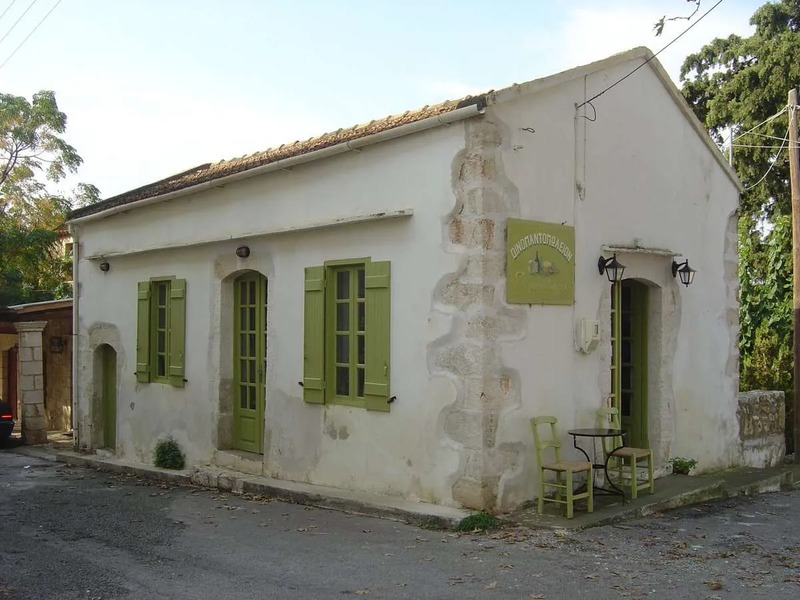 At Askifou the shop is 1.5 km from the accommodation and you may ask for a packed lunch or shop in Imbros during the walk. 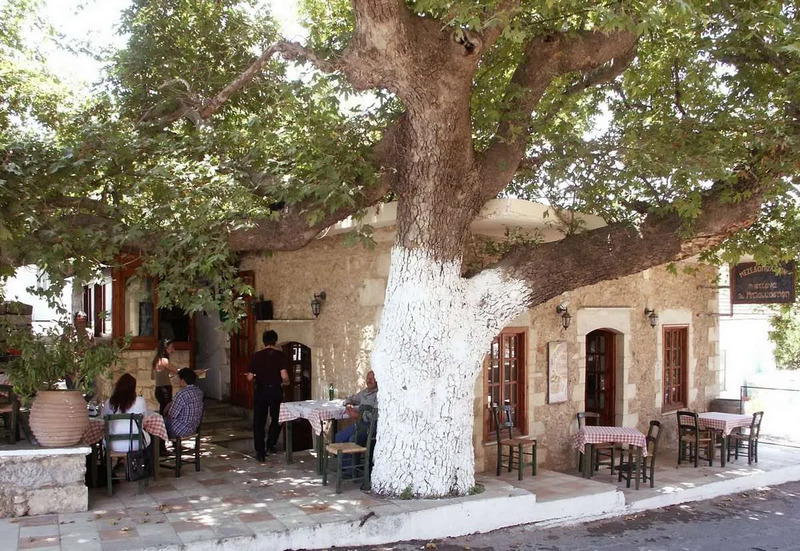 In the evening you have a wide choice of taverns at all locations, except in Askifou where you can only dine at the hotel itself. 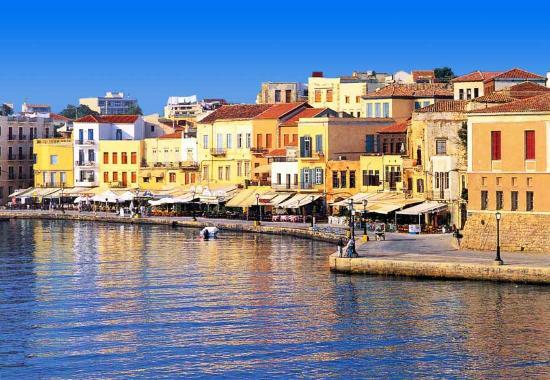 Our recommended arrival airport for this holiday is Chania. An alternative airport is Heraklion. Please insert your preferred airport in the “To” field below to see the available flights from your location. Transfer from Chania Airport to Vamos is possible by public bus, but it is not a good connection. You are advised to take a taxi from the airport to Vamos. The distance is about 30 km, so a taxi is not too expensive. If you land in Heraklion, from the bus station in Heraklion city (6 km from the airport, accessible by bus or taxi) there are direct buses to Chania (2 hours). The bus also stops in the village Vrysses, near Vamos, and a taxi transfer from Vrysses to Vamos is included in this package. 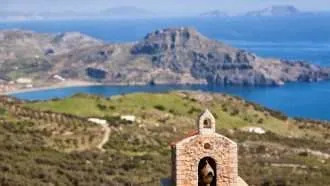 You may also travel via Athens Airport and take the night ferry from Piraeus to Chania, leaving daily around 9 pm and arriving in Chania at 6 am the next morning. There are cabins with comfortable berths on board and all cabins are en-suite. 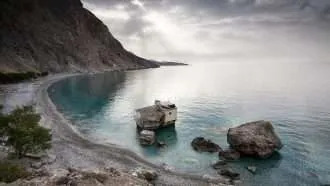 From the last overnight location, Loutro, you travel by ferry to Chora Sfakion (20 minutes) and continue by public bus to Chania or Heraklion. 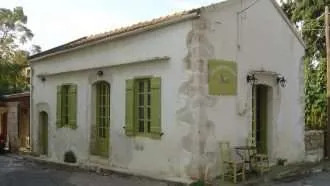 In case your flight departs in the morning you have to either book an extra night in Chania or Heraklion or book a private taxi transfer from Chora Sfakion to the airport as to be on time. 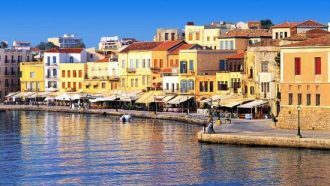 You can also take the daily overnight ferry from Chania back to Piraeus. Baggage transfers during all walks are included and your bags will be transferred by your current hotel (or by private transfer) to your next hotel. All belongings must be clearly marked with your name. Ask the accommodation owner where and at what time the bags should be left in the morning. 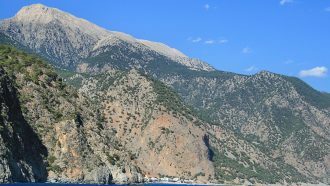 During this trip the luggage transfer from Chora Sfakion to Loutro is done per ferry and the hoteliers take care of luggage transportation to and from the ferries. This is quite common in this part of Crete and completely safe. Please have in mind that luggage is not always handled gently, so pack accordingly. When you travel with public transport or on a ferry you always take your luggage with you (including when transferring from Loutro to Paleochora on Day 8). Language: Greek. In big cities, many people speak English, but in remote areas, this might not be the case. However, most of the hotel personnel where we stay speak English and are ready to help you. Road signs/markers are normally in both Greek and Latin alphabet – and you can always call our 24/7 helpline if there are any problems. Currency: Euro (€). We strongly advise taking adequate cash for your daily requirements. Banks and ATMs are not available outside of big towns but credit/debit card payments are accepted in most places. 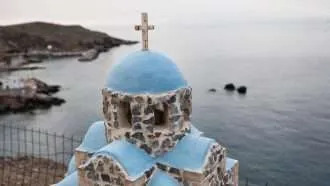 Up-to-date travel advice on Greece is available here. Detailed up-to-date travel information and hints will be provided in your holiday information pack. 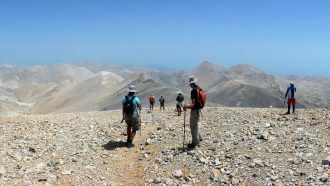 This holiday is appropriate for experienced walkers and requires a very good level of fitness, sure footedness and a head for heights. 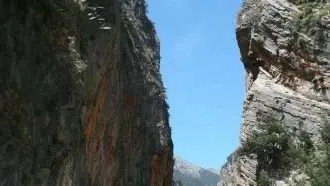 The trip includes strenuous day walks or trekking in mountainous areas: 5-7 hours walking per day; elevation gains between 500 and 1,000m per day. 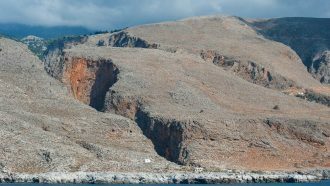 Some coastal sections go along exposed cliffs, and can be challenging (read more about difficulty grades). This trip is available between April and October. 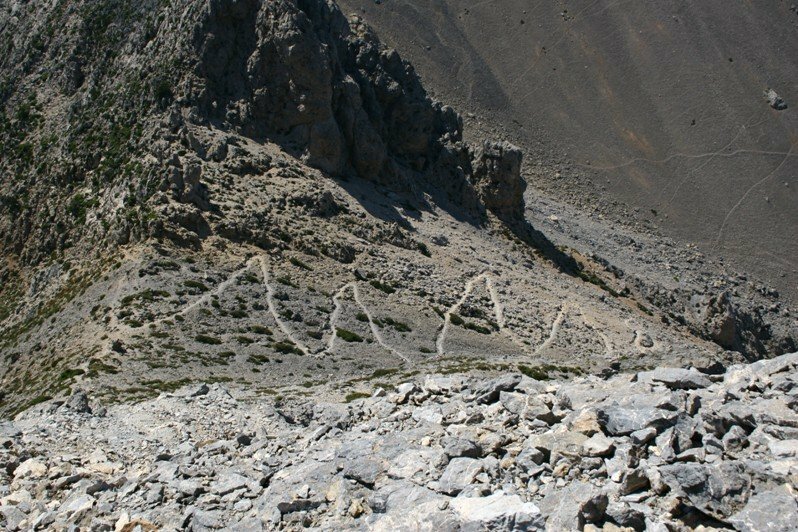 During summer months it can get too hot for hiking. 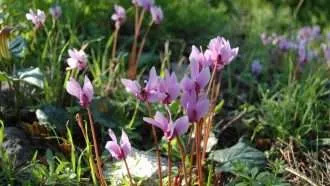 Best month to visit are either spring time (when nature is at its best) or in the autumn (when sea water is still warm). The flexibility of self-guided holidays means that there are no fixed dates and you can start your trip on any date in the season – so please indicate desired beginning date when booking. 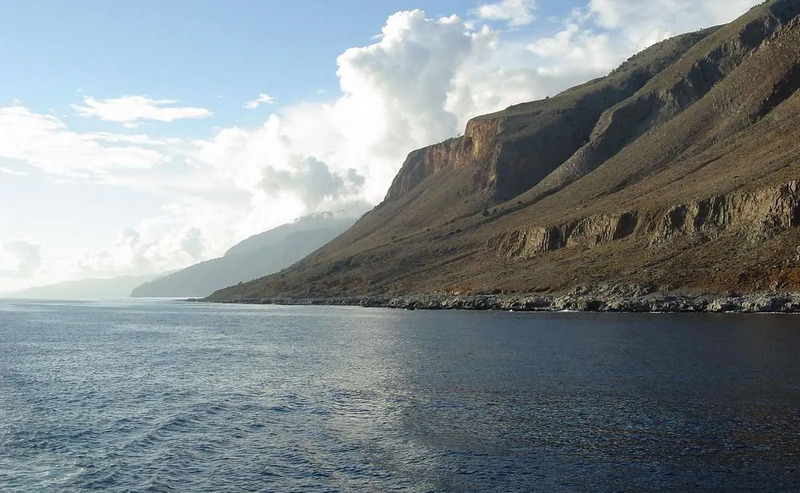 Crete has a Mediterranean climate, with mild and rainy winters, and hot and sunny summers. The bulk of the rain falls from October to March; in summer it almost never rains. 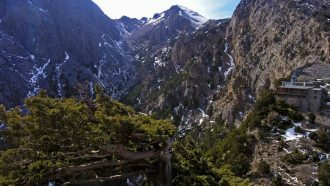 During winter, but also in spring, it can snow in the mountains. In the fine season, from mid-May to mid-September, the Meltemi (or Etesian) blows from the northwest. The southern coasts are more sheltered from this wind, especially in the coastal stretches that are located south of the mountains. The Meltemi, together with the lighter breezes which in any case blow on summer afternoons, has the merit of making the heat more bearable. During summer, heat waves from Africa can occasionally occur, with peaks of 35 °C on the coast, and 40 °C in the interior. 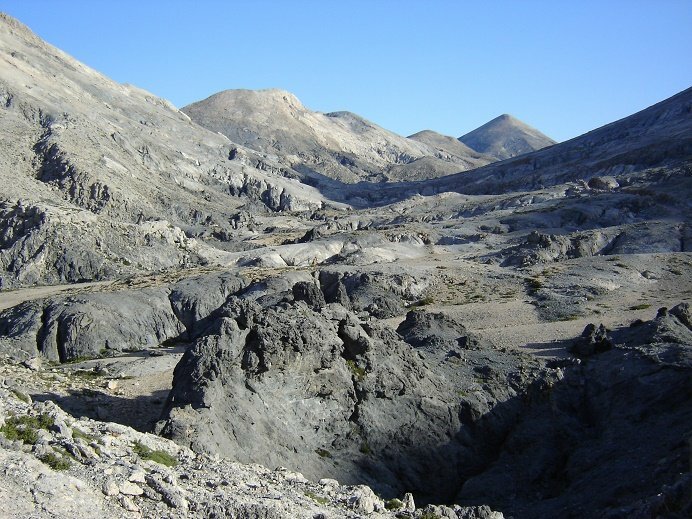 The hottest areas in these cases are the hills of the interior. The sea is warm enough for swimming from July to September, while it is a bit cool, but still acceptable, in June and October. 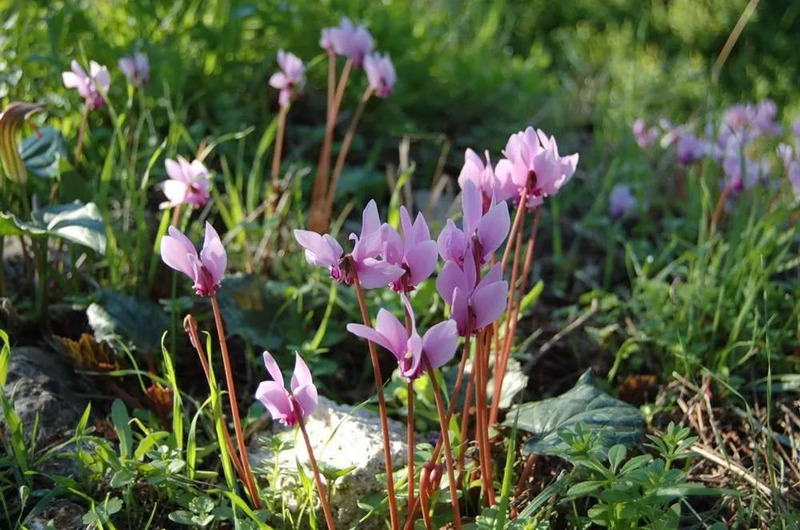 Spring and autumn are preferable to avoid the summer heat, especially April and May, and from mid-September to mid-October; spring is preferable because it is milder and nature is in bloom, although in the mountains it can still be cool. Detailed holiday information pack including GPS-checked and regularly updated route descriptions, route notes and maps. Please note that the info pack is emailed to you prior to departure and no printed documents are provided on site.